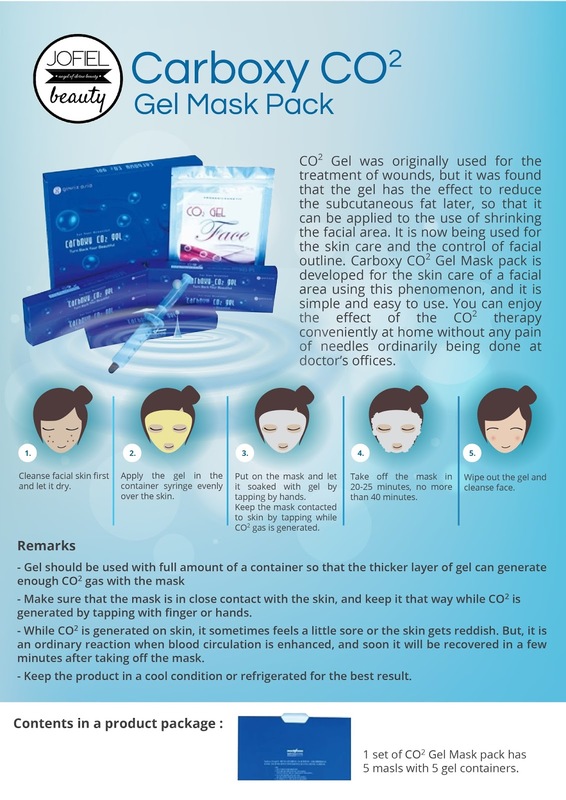 Now, have you heard of the Carboxy CO2 Gel Mask Pack that's getting really big in Korea right now? This breakthrough therapy generates activating bubbles that contain a proprietary formula, which stimulates skint o restore beauty, energy and health. Carboxy Face Masks deliver these amazing results and more in just a 30 minutes non-invasive treatment that works for all skin with no special equipment. The activating bubbles are absorbed into the skin without injection to increase oxygen and the skin's ability to assimilate necessary nutrients and eliminate destructive toxins. The benefits of carbon dioxide to skin have been well documented over years of studies and personal testimonials describing its remarkable anti-aging and corrective properties, even for acne and temperamental skin. Carboxy treatments are safe and easy to administer, even in the comfort of your home, and best of all, no down time with cumulative results that can be apparent from the first treatment. Sounds good? Let's see how these masks are to be used in the self-explanatory video below. Which basically reads: It doesn't matter what type of skin or what kind of skin problems you have. It will work for ALL skin types and problems. Together with the set of Carboxy Therapy Mask, I also received pure vitamin C serum to use along with the facial treatments for better results. Each box comes with 5 treatment syringes of the carboxy gel and 5 sets of paper masks for face and neck, packed separately. The Vitamin C serum are also packed in individual 2-compartment-syringes that allows mixing of the ingredients (vitamin c powder and hyaluronic acid) only at times of usage to keep the vitamin c from oxidising while in storage. A syringe usually last me for 2 nights of usage so I will keep it in the fridge to prevent oxidation. As advise, I first put on a thin layer of the vitamin c serum on a cleansed, toned face before proceeding to the carboxy mask. Each box comes with 5 syringes and 5 sets of face+neck paper masks, so there's really no point saving on the carboxy gel each time. But trying to use up the entire syringe each time is also quite a challenge on its own and I ended up wasting 40% of it on my neck the first time I tried using the mask as the thick layer of gel simply CANNOT stay on my face. So just a small tip for you, do use up about 80% of the syringe on your face by layering on the gel thinly, layer by layer and then thickening it at your problematic areas, namely your 'flabby' jawline, sagging cheeks, acne marks, pigmentation spots and etc. Do not use this mask the other way by squeezing the gel onto the paper mask before applying it on the skin, for the bubbles start to activate upon contact of the gel with the mask and you would want the activation to start while they're on your face. So yeah, just take your time and layer on the gel slowly, building it up as thickly as you can manage and then pasting on the dry paper mask onto your face. Using your palms, press down the mask at your cheeks first, then your forehead and chin. You will hear this sizzling sound and feel many small biting, prickly sensation as the activating bubbles started to work. Keep pressing and massaging your face in an upwards motion until all the sizzling stop, and you may carry on with the massaging for another few minutes before leaving the mask on for another 15 to 20 minutes. DO NOT keep the mask on for more than 40 minutes. After the 20 minutes is up, remove the mask and you may massage your face for a few more strokes, using the thicken gel that's leftover on your face, before washing them off with water or a damp facial cloth. After which, I went back to my Vitamin C serum and put on about half of the remaining content in the syringe, leaving the rest for the next night. The serum is very light and spreadable, and it might take a while to get absorbed (it feels a little sticky at first upon application). Just carry on with the light massaging motion and it will get absorbed fully, leaving your skin feeling smooth with no horribly sticky feeling. I swear that this is not a camera-angle at work. My pau-face transformed into an egg-face just after 1 application that required no more than 40 minutes of my time. Not only that. my skin tone got visibly brighter and the overall skin texture appears smoother and more refined. And these are after my 2nd usage, which I've successfully used up almost 80% of the gel on my face and the rest of the 20% on my neck. I had TWO horrible, angry red acne scars on my chin and the redness went off quite a bit after using the mask on them, too. For more information on the Carboxy Therapy Mask and Vitamin C serum, do visit Jofiel Beauty, their exclusive distributor in Singapore, HERE. EDITED: There has been an anonymous comment posted here with a mobile number, promoting for sales of carboxy products. Please note that the contact number posted does not belong to Jofiel Beauty, the licensed seller of Carboxy Therapy products. Jofiel Beauty will not be responsible for any undesirable results due to unauthentic carboxy therapy products purchased from unknown anonymous sellers. I haven't tried using a mask so I always wonder how it feels like after using. This product looks promising. I wonder if Its available here. I am a fan of facemarks and am currently going thru my Skin18 haul. This links super as well. omg those mask for face treatment tho! OMG ... soo worth it.. I so want to try this one out since it worked for you well. I doubt if I'd get this brand in my country.